And you thought your mother was nuts. 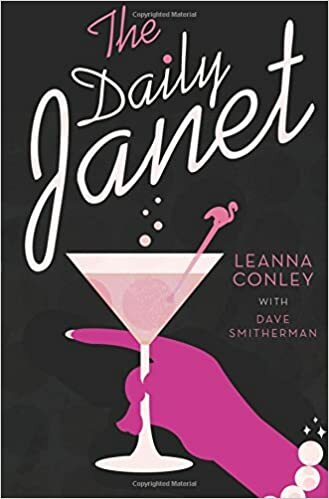 From hilarious drama to childhood trauma, ‘The Daily Janet’ chronicles author and comedienne Leanna Conley’s journey of being raised by a 1960s fashionista before the Devil had even heard of Prada. Janet is a chain-smoking martini enthusiast who swears like a sailor but dresses like Audrey Hepburn, and her erratic behavior has made for a sometimes stormy, but always loving, mother/daughter dynamic. Be prepared to laugh out loud at Janet’s antics and pearls of wisdom as Leanna hops on the tumultuous ride to adulthood. . .in one of Janet’s Cadillacs, of course. From the moment I started this biography, I became completely engrossed, I forgot to go to sleep early as I originally planned. Leanna Conley is a natural born storyteller with a flair for the comedic, which I imagined she inherited from her mother, Janet. Since I’m not one to read a lot of biographies, I had agreed to read this one expecting it to be just another biography with comedy here and there. I didn’t prepare myself for what lay in store. Janet is truly a wild, wise woman that you just can’t get enough of, no matter how you try. The Daily Janet offers everything a good story requires: pain, drama, comedy and love. She’s a class act with a wild side. I highly recommend this extremely pleasurable read. You won’t be disappointed. Nice review! You mentioned Prada so I guess i have to read it! Oh Thank you darling! Yes, if only more Prada’s were out there we’d be wildly sassy! Thank you for reposting Don, a true Gentleman! Cheers, darling.